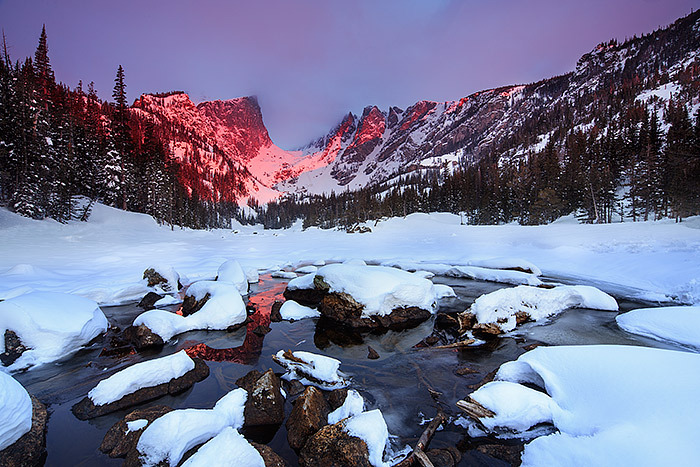 A serene sunrise errupts over Hallet Peak and Dream Lake on a quiet and peaceful morning in Rocky Mountain National Park. It's already springtime at Dream Lake but it would be hard to tell the difference from winter. The outlet of Dream Lake has thawed just enough from a long winter to allow a reflection of Hallet Peak in the chilly waters of Dream Lake. Photo © copyright by Thomas Mangan.